Less than 5% of adults participate in 30 minutes of physical activity each day; only one in three adults receive the recommended amount of physical activity each week. Regular exercise or physical activity helps many of the body’s systems function better, keeps heart disease, diabetes, and a host of other diseases at bay, and is a key ingredient for losing weight. 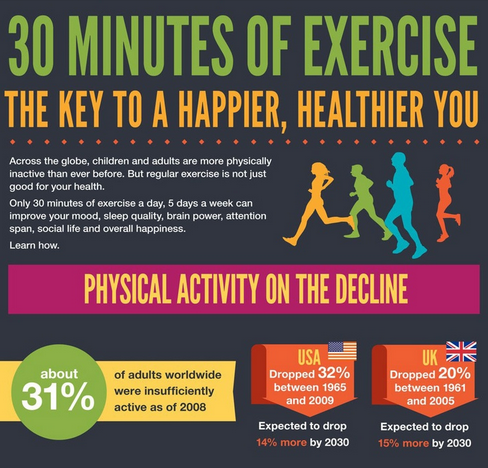 Physical activity can improve health. People who are physically active tend to live longer and have lower risk for heart disease, stroke, type 2 diabetes, depression, and some cancers. Physical activity can also help with weight control, and may improve academic achievement in students. Remember to check with your doctor before starting a new exercise program, especially if you haven't exercised for a long time, have chronic health problems, such as heart disease, diabetes or arthritis, or you have any concerns.